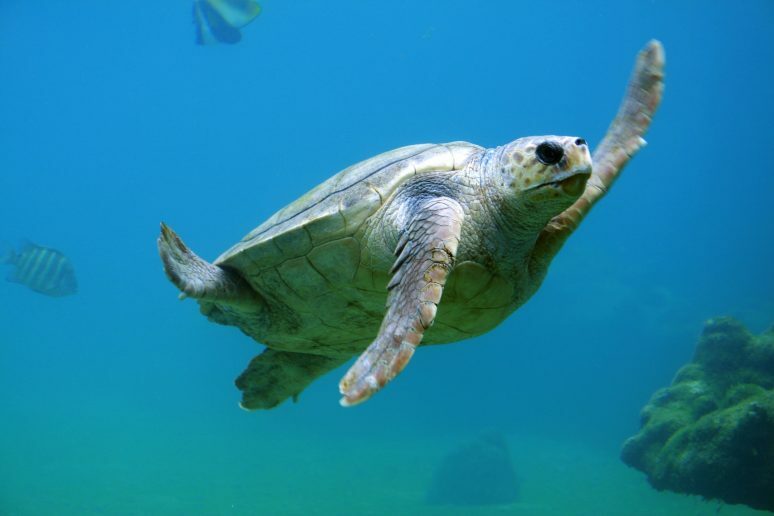 Turquoise water, marine turtles and the most beautiful reefs. 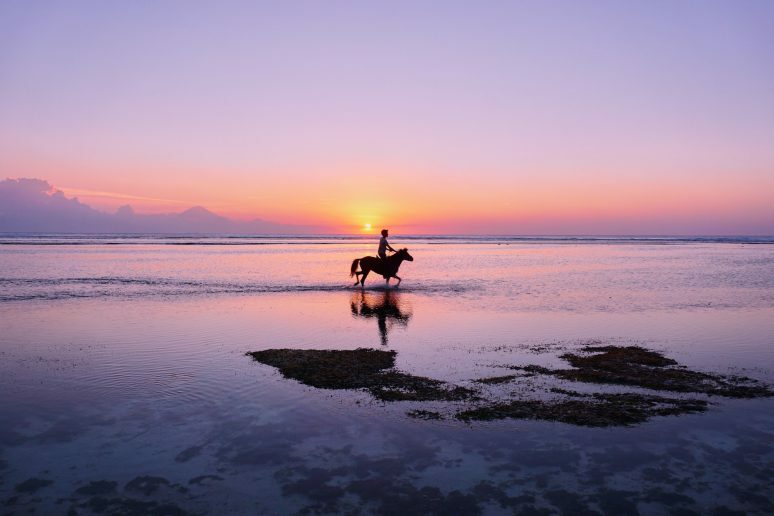 Gili Trawangan is a true dream destination you definitely shouldn’t miss when coming to Indonesia. 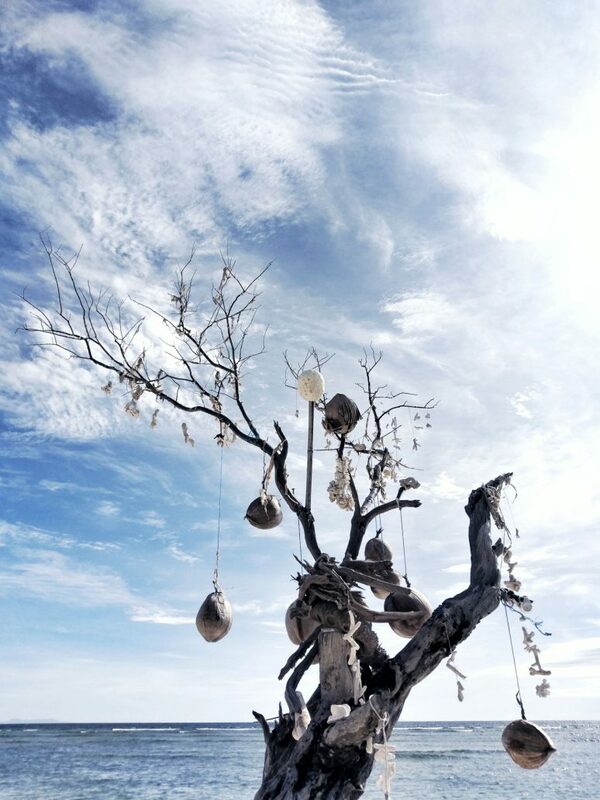 Next to Gili Air and Gili Meno, Gili Trawangan is the biggest of the tree Gili Islands. The Island is inhabited by only roughly 700 people. They live from tourism and fishing. With a circumference of less than 7km, this island is pretty small. You can walk around it in about one hour! 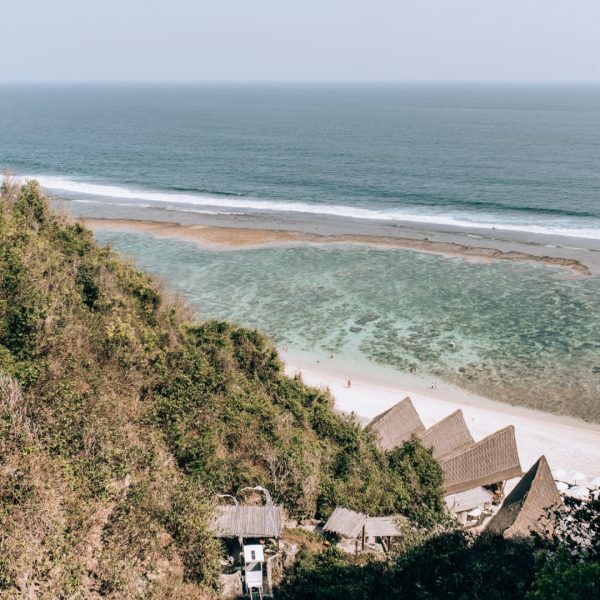 When we first got there, we were blown away by the true beauty of the Gili T and the open hearted mentality of the locals. 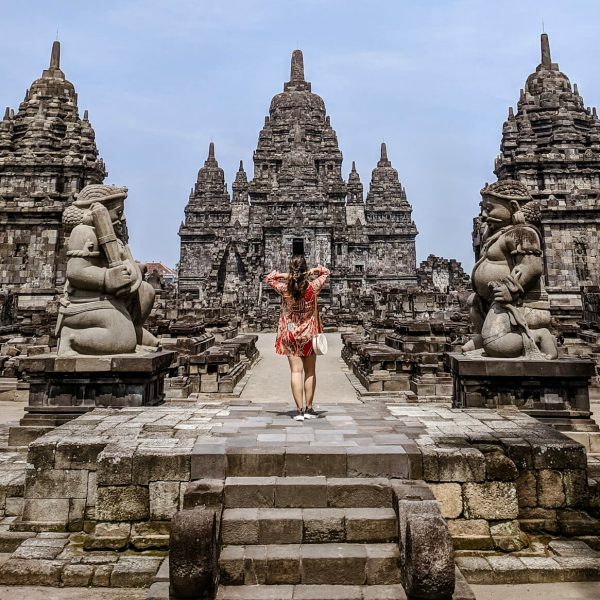 It is definitely a must, if you are traveling to Indonesia. 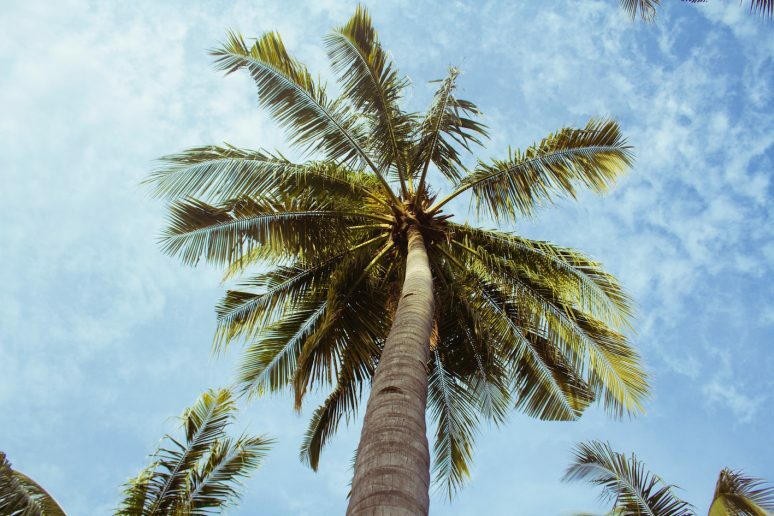 Here is a quick guide to Gili T to help you make your stay on this island as magical and paradisiac as possible! First of all, lets talk about how to get there. This seems like a pretty easy question but it can actually be quite difficult. There are several slow boats as well as speed boats that go and return between the Gili Islands, Lombok and the main Bali island. A speed boat ticket will be about 200,000 IDR, that is about €12 and a slow boat ticket can be much cheaper. However, I would always suggest to go with the speed boat, they almost go every hour and only take about 20 minutes from Gili Trawangan to Gili Air, for example. If you come from the main Bali island, this will take about one hour and will be a little bit more expensive! I would always recommend to buy the tickets one day in advance. Just to be on the safe side. The best ferry company is Eka Jaya. It even shows movies while you are traveling (pretty cool!). 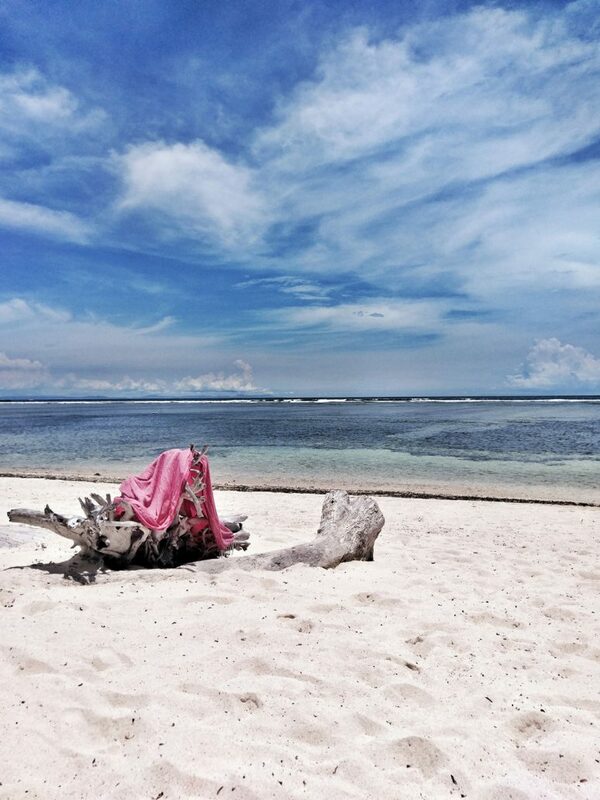 If you want to see lonely beaches, crystal clear water and pure white sand, then Gili Trawangan is your best choice. There are two halves of Gili T: the sunset half and the busy half. The prettier beaches are definitely on the sunset half. We always spent the whole day there. We went during lunch time, had our coconuts, sunbathed and swam with the colourful fishes. Later, we had dinner watching the sun set and drank cocktails during the night. 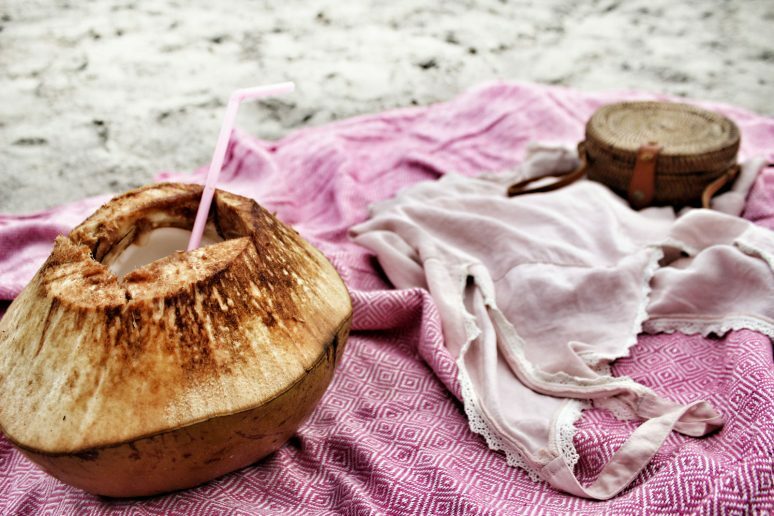 Looking for incredible iced coffee and fresh coconuts to escape the heat? The best restaurant on the sunset half of the island is definitely Exile – it’s a great place to chill and relax. At this place you will also see one of the famous swings. And always remember, most of the time you are alone at the beach. Especially during off season, when nobody will disturb you when you grab your book and doze off at one of the many hammocks all around the beach. Food in asian countries can be a bit difficult for the western society. Especially due to the fact that asian meals mainly contain meat or fish and dairy. It can be hard for vegans/vegetarians to find places to eat – so here’s some help! Luckily, Gili T has lots of opportunities to eat vegetarian and vegan! 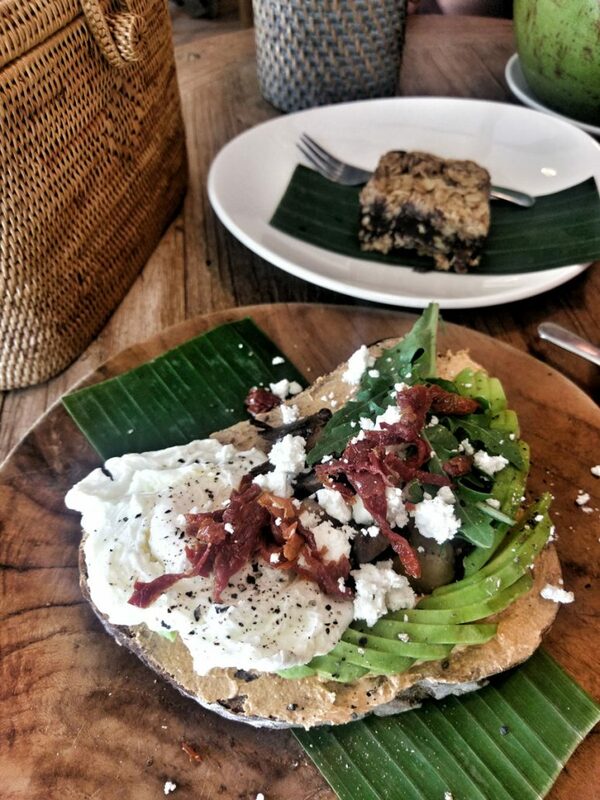 Kayu Cafe: this is fully air conditioned and is beautifully furnished! The staff are really nice and you immediately feel like home there. 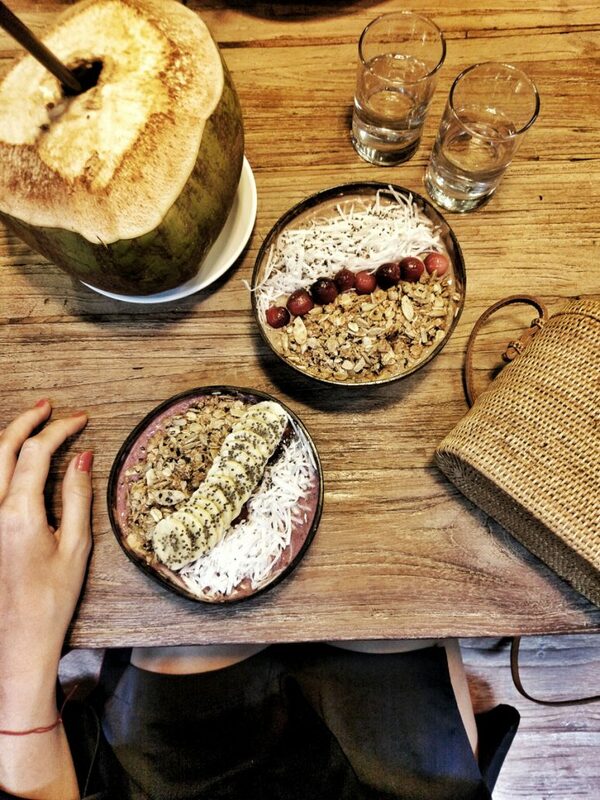 At times, when it rained outside, we spent hours here, having coconut after coconut and ordered the most delicious vegan smoothie bowls and raw peanut butter cakes. The Banyan Tree: this place makes you feel like you’re sitting in a San Francisco street cafe. It has pretty paintings on the walls and you get the best pancakes and vegan sandwiches here. From the air conditioned balcony you can see over the ocean and watch the diving schools and snorkelling kids. If you rather want to dive into the local food culture you definitely have to check the night market. It is located about 100 meter next to the harbour. Here you will find the cheapest seafood and the most alive night life. At first I was a bit overwhelmed and shocked by all the hustle and bustle. But after the second and third time, I started to like this happening place and all the laughing and joyful locals. If tanning and sunbathing at the beautiful beaches is too boring for you, you can easily rent snorkelling equipment from locals and check out the underwater world by yourself. 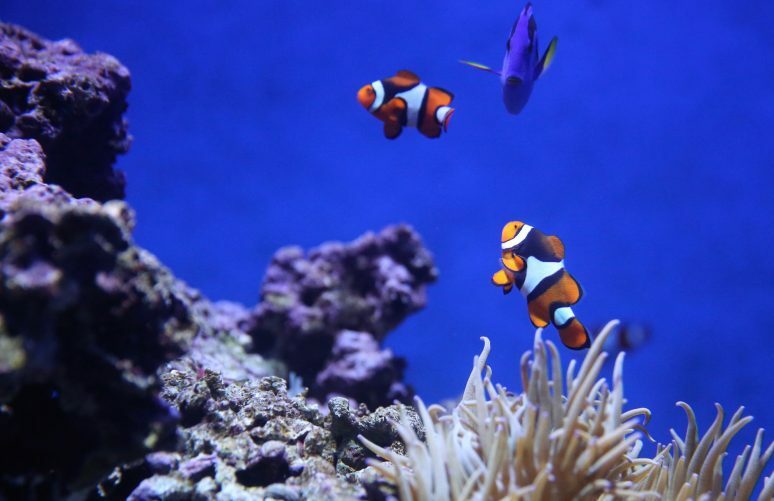 They also offer full day snorkelling trips, which is so fun! We booked a private snorkelling tour with one of the locals. He took us out on the water with his little tiny boat and guided us to the most amazing snorkelling spots. We saw the largest manta rays and the prettiest most colourful fish. If you rather want to dive deeper into the underwater sea world, you can do a diving course at one of the many diving teaching spots all around the busy part of the island. I would suggest to take a day trip to one of the neighbouring islands, Gili Air or Gili Meno if you have an extra day left. And explore this romantic tiny place. 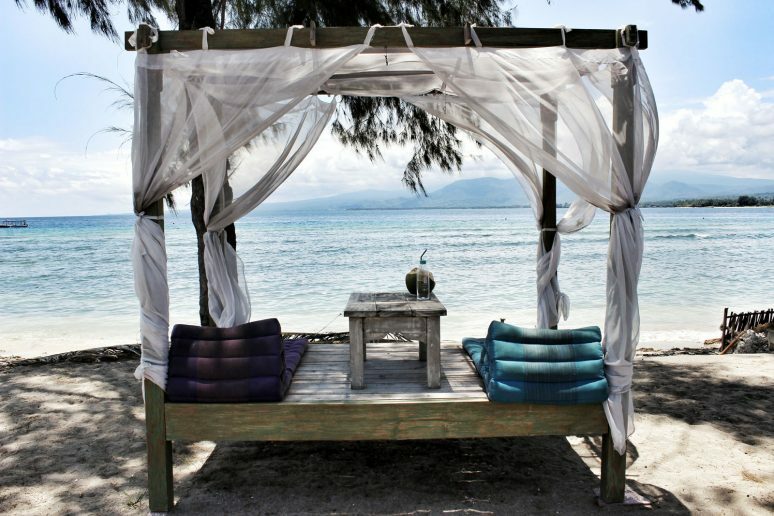 Compared to Gili T, Gili Air is slightly less party heavy and has a more relaxed vibe. 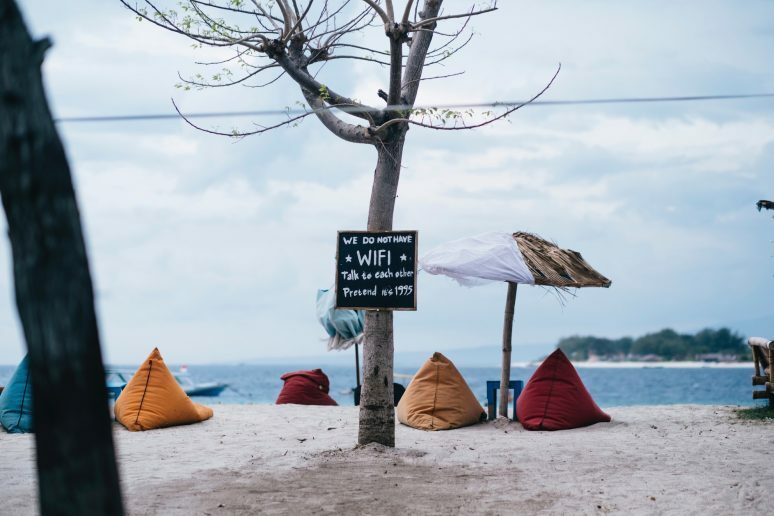 On Gili Meno you will find even less activity, just one or two sunset bars and restaurants spaced out around the island. If you are searching for a taxi, a car or even a scooter you will be disappointed. 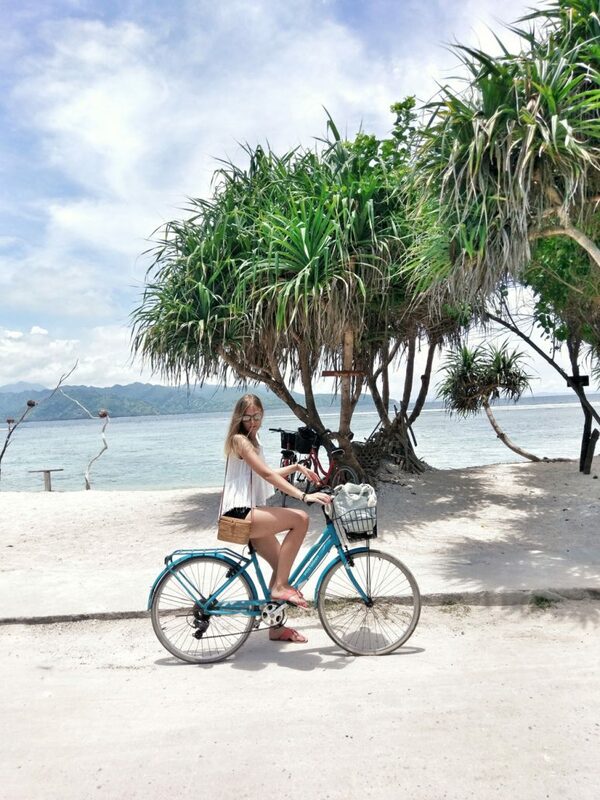 All the Gili islands are car and motorcycle free! Pretty amazing. They want to keep their nature and the beauty of the island alive so they forbid the use of cars or any electronic vehicles. To get around you will have to go by foot or by bicycle. You can rent a bicycle for 40,000 IDR which is about €2.50 for 24 hours, which is pretty cheap. If your hotel is not renting bicycles you can find them everywhere next to the beach and on the busy part of the island. WATG Editor Edit: The other option to get around the island is by horse and carriage, however this option is absolutely not recommended or supported by We Are Travel Girls. The horses on the island are known to not be well looked after and in some cases have died in the streets due to malnutrition, heat and exhaustion. We suggest that you thoroughly research this mode of transportation before considering using it on the island. 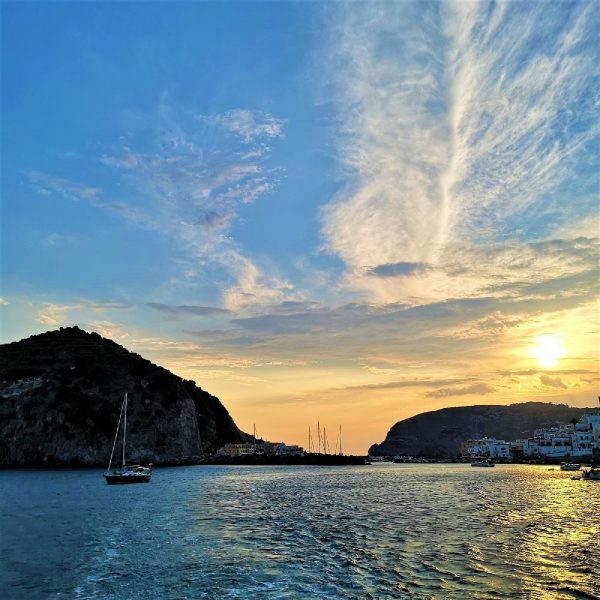 We also suggest booking accommodation close to the port and boat docks so that you do not have to rely on these carriages to transport your luggage. Gili Trawangan is one of the most beautiful places, the locals are the nicest, the happiest and the water is the clearest. 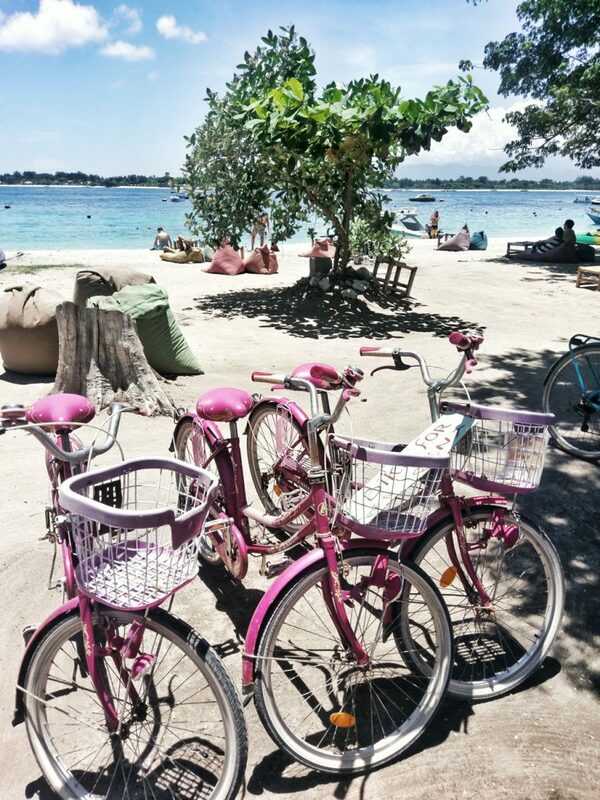 You definitely shouldn’t miss out on Gili Trawangan on your next trip to Indonesia! 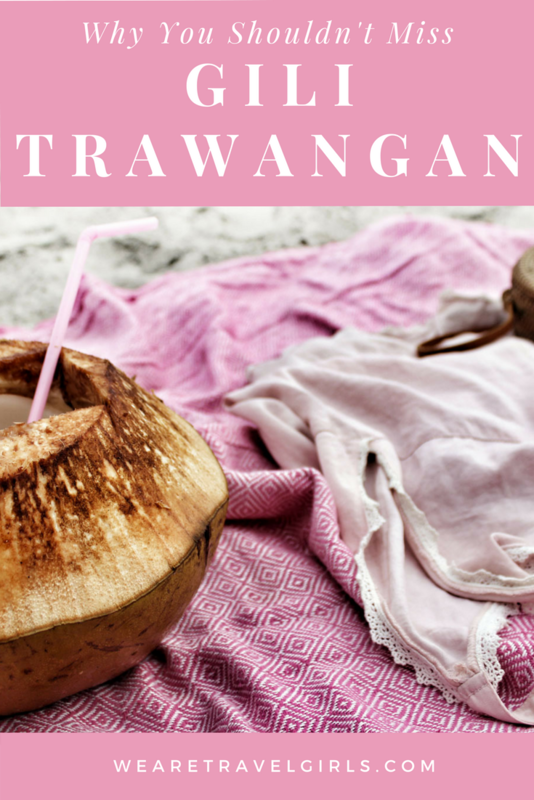 We hope that this article has inspired you to visit Gili Trawangan! If you have any tips for our readers or questions about the destination please leave these in the comments below. I’m actually kind of appalled that the horse carriages were suggested as a feasible mode of travel with only the little blurb about how you aren’t crazy about them! I think the blatant and horrific abuse I witnessed here should be made loud and clear by more bloggers. I am horrified that people still even visit this island and ignore this abuse. I have spoken as loudly as possible including a blog post and writing to the Indonesian ministry of tourism and most major hotels on the island. If more people didn’t simply brush this suffering aside and stopped promoting this place, maybe change would be made. I’m dismayed that WATG published this considering the level of abuse that has been well documented on this island.